Steven Pressfield – Been There. Doing This. It is often said in story that creatives are troubled souls. They live difficult lives which expresses itself in their art. Then they have a challenging career trying and struggling to make a living doing what they love: creating. They don’t take the typical path many people follow. They must create. Being a creative myself, I think of this. And then I think about many entrepreneurs I interviewed and read about this past winter. Many of them describe a fear of getting in their own way of moving forward in their creative venture. This is so striking to me, and I can relate more than not. Creating a vision, whether its wall art or a business, is creating; and this is hard. Every time. There’s risk to be faced with, vulnerability. Steven Pressfield writes a whole book about this in The War of Art: Break Through the Blocks and Win Your Inner Creative Battles. I can’t count how many times I’ve heard this book referenced in other resources I’ve studied since, and I revisit this read often. Pressfield points it out right up front: “It’s not the writing part that’s hard. What’s hard is sitting down to write. What keeps us from sitting down is resistance.” You can substitute [writing] for your creativity of choice here. 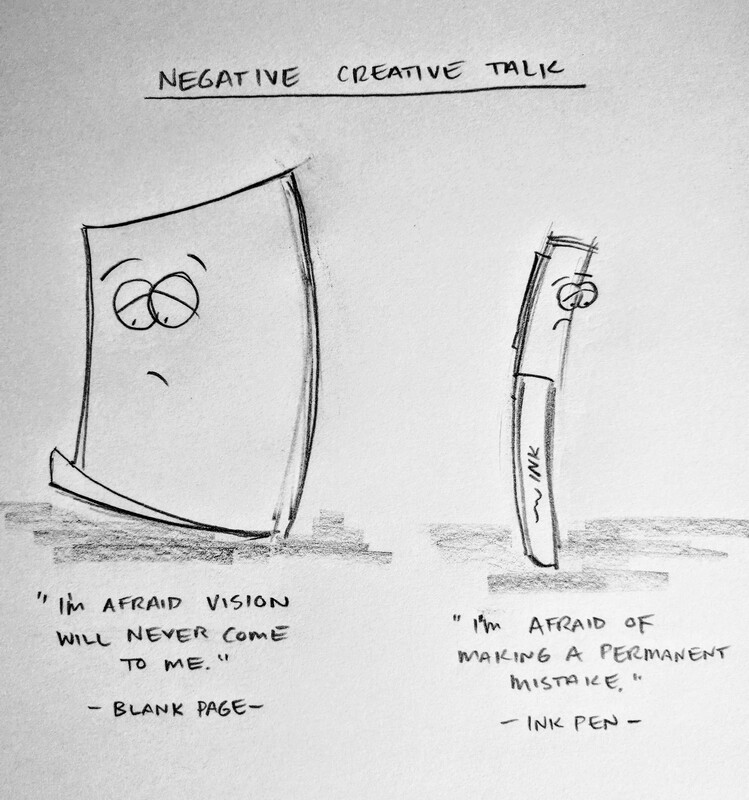 Figuratively speaking, this illustration highlights the negative self talk we do that builds creative resistance. Some people have visions [blank pages] that never come to life because they’re afraid each move is a pass-or-permanently-fail scenario. Therefore, the steps are never taken where the pen meets paper, where new creativity comes to life. The reality is that the permanent pen is a pencil, a constant work in progress. It’s only a permanent mistake if you don’t learn along the journey, from both the failures and successes. As a side note, I drew this illustration in pencil, not ink; and I drew it three times before I got it right. Pressfield also says “Most of us have two lives. The life we live, and the unlived life within us.” —This is the life we create. There’s no such thing as creative block, just a fear of putting ink to the page. Just start. The pen and paper would look far more cheerful if you did.